[Image: Leah Beeferman/BLDGBLOG, The Helicopter Archipelago, a flying micronation/airborne utopia; from an article by Geoff Manaugh originally published in Blend]. [Image: Ron Herron/Archigram, The Walking City]. Herron also had openly utopian intentions for the project. If the city didn’t like where it was, for instance – if its residents found their surroundings boring, oppressive or even quasi-fascist – the whole thing could simply stand up and walk away, re-settling itself elsewhere, freed from the constraints of law and geography. But what if you didn’t live in the Walking City – indeed in any city at all? What good would it do you then? 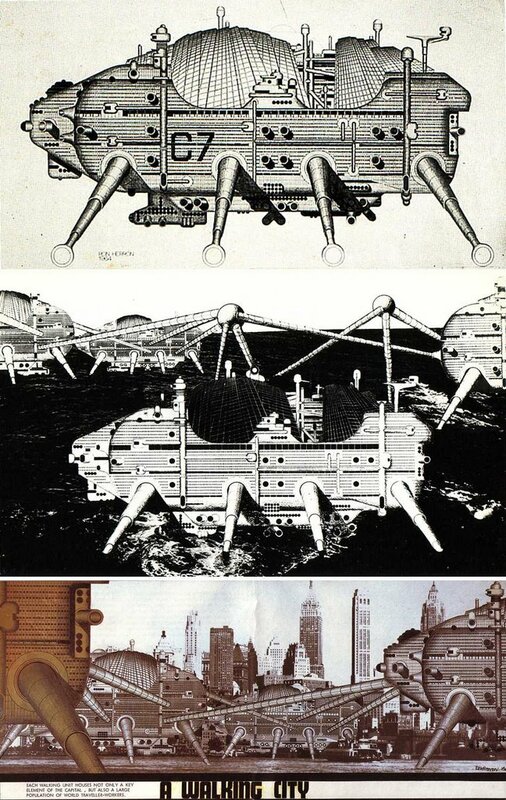 For those of us trapped in a cultural desert, Archigram had another solution: the Instant City, flown in by hot-air balloon and helicopter and deposited anywhere in the world. The roofs, domes and canopies of a new metropolis could earn an official post-code in the blink of an eye. [Image: Leah Beeferman/BLDGBLOG, close-up of The Helicopter Archipelago]. Running on solar power, the helicopters would stay perpetually airborne – even as new machines latch on with rope ladders, the shape of the archipelago changing as its population expands. Pilots and passengers both could move between “islands” on bridges and zip-lines, which rearrange as the choppers switch position, moving in and out of formation. All repairs would take place mid-flight. A kind of flying Hawaii, or anti-gravitational Micronesia, with tanned deck-hands leaping across aerodynamic tailfins to the soundtrack of ceaseless enginery, the helicopter archipelago would act as an escape hatch from traditional, nation-state sovereignty. Its government would be a parliament of pilots, led by experts in storms, whose access to climatological data – future weather, air speed, barometric pressure – would determine the nation’s route and direction. Of course, these helicopters would not be the first manmade archipelago. Today in Dubai, for instance, private hoteliers are developing both “The World” and “The Palm,” two artificial island chains of robotically-displaced sand upon which hotels and housing are being constructed. [Image: Photographer unknown; creating an archipelago in Dubai. (Via Pruned)]. [Image: The Palm (Via Pruned)]. – and an underwater hotel, where guests will look out through glass walls at schools of exotic fish. Dubai supplies an interesting model, here, because if the helicopter archipelago ever found itself in need of a few extra – dollars? euros? pounds? – it could simply open itself up as a fantasy hotel. When the pressure of living terrestrially becomes too much, Tom Cruise and Katie Holmes could raise their kids there. But if a flying resort of 7-star helicopters is too bourgeois for you, another manmade island chain worth considering is the aesthetic ancestor of Archigram’s Walking City: England’s Maunsell Towers. Built by the British Army during WWII, and named after their architect, Guy Maunsell, the Maunsell Towers were an offshore military fortress from which Army gunners could shoot down Nazi aircraft en route to bomb London. [Image: Photographer unknown; the Maunsell Towers – for more information see Underground Kent]. Now rusting and derelict, the Towers have become eccentric tourist stops – yet the Maunsell Towers are just one example of offshore structures put to new use. Sealand, for instance, is a self-declared country, constituted and run on a former anti-aircraft platform in the North Sea; today, it remains economically active as a data haven and pirate radio station, and it even issues passports – for which it has earned the status of micronation. So could the helicopter archipelago itself become a micronation? If so, how would it support itself, nutritionally or otherwise? Could it have a seat at the U.N., or join the E.U., perhaps even train an Olympic team? There might be flying gardens, for instance, bulging hammocks of soil cultivated to bear fruit. Almond trees, apiaries, chicken coops. A flying aquarium, with cloned fish suspended in pools above the Gulf Stream. An arts center, hospital and gymnasium. [Image: Leah Beeferman/BLDGBLOG, postage stamp for the Helicopter Archipelago]. [Image: Leah Beeferman/BLDGBLOG, flag for the Helicopter Archipelago]. – and compose folk songs. Babies born onboard will be declared instant citizens, and the archipelago will welcome immigrants, incorporating whole new helicopter clusters at a time. Once the archipelago is aloft for more than a century, the International Geological Society will declare it a flying continent, the world’s first airborne tectonic plate. [Image: Leah Beeferman/BLDGBLOG, The Helicopter Archipelago; from the original article by Geoff Manaugh, published in Blend]. (Note: Leah Beeferman, who illustrated the “Helicopter Archipelago,” is a Brooklyn-based artist and the graphic designer for Cabinet Magazine. [Cabinet, in fact, has a whole issue on micronations, if you’re curious]. Leah’s work has appeared on BLDGBLOG once before. Meanwhile, Lonely Planet is getting into the spirit with their forthcoming Lonely Planet Guide to Micronations, co-written by none other than Simon Sellars of Ballardian.com). I’m sorry, I don’t buy anyone calling Sealand a micronation. You’re not a country until you have a national soccer team. Helicopters are inherently stable — if left to their own devices, they fall out of the sky. It’s a lot like trying to balance a marble on a pane of glass. That means that there’d need to be whole crews of pilots keeping the city in the air. Taking shifts, staring out into the bleak, featureless ocean, performing their balancing act for hours on end. What if one falls asleep on the job? Dan – They’ll take modafinil. Have you read about that stuff? It’s apparently some anti-sleep wonder drug; you can stay up for days and days and “there are no side-effects” – at least within the time frame of the study. So you’ll have this unsleeping – but not zombified: you’re apparently perfectly aware and talkative – staff of helicopter pilots peering out over the sea, reading charts, calibrating things. Their helmets will have small voice-activated recorders in them, so that oracular, Homeric pronunciations about the sea and human destiny are recorded into the archipelago’s audio logs… Bringing back the epic as a literary genre. Public memory. The helicopters have intercoms all over the place and you can listen to the sleepless whisperings of pilots, like the oracle at Delphi, as you ritually cross and re-cross the Arctic Circle. And I am 1000% behind the football team… Bring it on! A flying football pitch, cabled between the four largest helis. With nets around the edges so you don’t fall off. Or lose your balls. Wow. I hadn’t heard about Modafinil. I used to have a prescription for Dexedrine. Terrible stuff. The mood swings weren’t worth the increased alertness. Of course, if Modafinil solves all of those problems as they claim, then it sounds perfect. And you’re right, it’s difficult to imagine what would run through the mind of someone on the 88th hour of their shift at the controls. It would be fascinating to hear. But what effect would it have to pipe those thoughts throughout the city as you suggest? It would certainly affect the atmosphere (pun unintentional) of the city. After several generations, would the entire population tend towards inquisitiveness and insightfulness? Or would they be slowly driven insane? Anyway, you’ve convinced me, let’s do this. I’ll totally take a Helicopter Archipelago pint glass. And Michiel, I love that tennis court – ironically, of course, it’s actually a helipad. And would the inhabitants of the Archipelago be driven insane by the mutterings of modafinil’d chopper pilots? Probably. But it’d be a very interesting insanity. A helicopter city seems like something that Miyazaki would love (particularly considering his fascination with flying machines). It’s the logical extension of his designs for walking castles, after all. I’m cudgelling my brain to remember the author of the science fiction novel about the flying cities that traveled through space–Earth cities that had been fitted with generators that held an atmosphere and allowed them to travel as they pleased. They combined into a confederation that governed their relations with planetary governments. I don’t remember much concern about how the cities were supplied, except where the need of some materials became a plot element. With regard to how the helicopters could be controlled indefinitely and whether pilots would have to take modafinil to go on long shifts…this reminds me of how a result would be the creation of a very specific class of citizens with vastly different lives from everyone else, much like the Guild Navigators in Dune who needed another specific substance – “melange” or “spice” – to be able to navigate the ships through space. Another note on this is that if all that is needed for baseline operation of the Helicopter Archipelago is stationary altitude maintenance then development of a sufficient autopilot would be fine. This would not even be that difficult, compared to moving the archipelago from place to place. And members of the pilot’s guild would only be needed for specific operations, such as moving the archipelago, management and supervision during repairs, handling weather situations, and possible interactions with others (defense operations, docking, etc). I like how this whole idea really stretches even the current concept of a micronation! When I was ten, I designed a kind of fascist American version of the ambulatory city, a Mega Nation tank. It was a gigantic tank with a gun turret that looked like a Capitol dome. (the main gun fired remote-guided kamikaze F14’s) It housed the library of congress, senate, house, a hotel, a shopping mall and an Opera House, not to mention housing fully functional Army, Navy and Air Force battalions). The President would be constantly hooked up to brain wires in the control room, running its many functions. How the gigantic weight of such a thing wouldn’t sink it into Earth’s deep crust wasn’t answered by me. I’m suprised that I’m the only one to mention blimps/zeppelins. Surely the easiest way to build a flying city would be to suspend it from blimps/zeppelins. Keeping lighter than air vehicles in the sky would be a much less technically complex task (correct me if I’m wrong, I’m hardly an expert) than the fine balancing act required for helicopters. Plus, huge airships could relatively easily be covered with solar panals compared to helicopters and they would only require that energy for moving rather than requiring a constant supply to stay aloft. Airships are recieving revived interest as extremely heavy cargo haulers and long duration aircraft so they would be well suited to keeping a city flying. It seems that I recall a slight fact about helicopters: their blades wear out. Unless you had enough redundancy, so that one or more helicopters could completely shutdown for blade repair, there’d be problems. The whole idea of a city floating inside the atmosphere seems ridiculously halfcocked, to me. Why not just build the space station you’re discussing, with higher cost and less engineering problems? Space isn’t regulated, it’s “international”. Plus, no fuel expenditure to remain aloft. Park in an Lagrange point (for easier acces to moon and earth), or a geostaationary orbit. Zeppelins, helicopters, orinthopters, whatever, why restrict yourself to a planet? Perhaps that’s the point. And this site is already full of zeppelins, blimps, hot air balloons, international space stations, pirate cruise ships, etc., so I didn’t want to repeat myself. I think this idea would be considerably less interesting, for instance, if it just proposed another international space station. Full-stop. Surely, the history of science fiction is already littered with such outer space utopias…? I could just quote Star Trek and be done with it. Meanwhile, transnational air space is not regulated; you can do what you want up there – thus, the helicopter archipelago’s ability to declare itself a micronation and win a seat at the UN. In other words, it doesn’t have to go into space to escape regulation. And since the helicopters are solar-powered, you also don’t have any fuel expenditures – but thanks for the warning. Finally, “All repairs would take place mid-flight” – answering your concerns about regular maintenance. Also: if you park yourself in a Lagrange point, you’re still “restrict[ing] yourself to a planet,” in the form of that planet’s gravitational effects (which are as much a part of the planet as its atmosphere is). So I don’t really see what your version of this offers, other than a re-tread of something ten thousand other science fiction writers have already described before. And, for the record, I wasn’t aware that I’d been discussing a space station (re: “the space station you’re discussing”). I thought I was discussing a linked network of solar-powered helicopters flying permanently over transnational seas, full of folk songs, tanned deck-hands, and hammocked fruit trees. And unexpected opportunities for undersea utopias still abound. Dude, this is just like that one G.I. Joe episode. You know the one, it was where Cobra had that giant flying base. Well, I guess that was all of them, but still. We all live in a yellow interconnected helicopter archipelago… The mentioning of Maunsell towers prompted me to look them up. I find it very fascinating that one of them was once home to a pirate radio station. The fact that you mentioned both the Dubai islands and Sealand made me think of Michael Oliver’s ill-fated Republic of Minerva. It would have been a good idea if Tonga hadn’t chosen to take over the (uninhabited and useless) island. I’ve often wondered whether a nation could be convinced to part with some of their territorial waters for such a project. Perhaps Tuvalu, currently sinking under the rising waves. A group of wealthy investors could offer the nation a second chance; in exchange for a few square miles of suitable ocean space, they would spend the billions needed to build up the islands to a safe height. A nation is saved, a nation is born. Too good to be true, perhaps. Why not? Tuvalu has already sold their “.tv” web address to a cable company long ago. I think they’d clutch at any straw that’d keep them afloat.